This is the second of several posts walking through an implementation of the Enigma cipher in code. The goal of analyzing the Enigma machine is to better understand the workings of a device that played an important role in the history of computing. It is also an excellent system to better understand some of the design decisions we make when creating a code representation of a problem. The intention is to replicate some of the encryption mechanisms of the original Enigma. From the Part 1 post, which covered more about how Enigma works, we have built up a basic understanding of what each step does. In this post we discuss how to implement this functionality. One of the first decisions typically made (sometimes implicitly) is whether to implement the Enigma as a function or an object. Is the Enigma a noun, or a verb? Programming in a language like Java or C++, the noun approach seems perfectly natural: start with an Enigma object (the noun), and create more objects to represent more of the nouns (the switchboard, the rotor wheels, and the reflector). Each component is modeled as a black box function taking a character in and returning a character out. Each component stores and organizes information important for it to perform its particular transformation. For example, the rotors would store the scrambled version of the alphabet that they implement, while the switchboard and the reflector would store the connected letter pairs. This approach reflects the kind of engineering approach that was taken to the design of the Enigma: many simple components, working together in concert, result in a more complex integrated system. But one of the reasons the Enigma machine is an interesting system for implementing in code is because of the simplicity of the mechanical operations performed. This can help identify where a person actually begins the software design process. If the design process starts with one foot in the world of objects already, the object approach will be adopted by default. With this approach, we are reshaping our data structures to fit the problem. This makes the implementation more modular and the driver easier to read at a high level. However, reshaping the data structures to fit the problem and our abstraction of it can lead to more inefficient code and implementations. Instead, we can start by examining the encryption process itself - the verb of encryption. The action of encryption consists of elementary steps - swapping out two characters. Each of these actions is simple enough that it can be implemented using built-in string manipulation methods, and all of the quantities being stored are likewise simple enough that no exotic data structures are required. The verb approach requires considering the problem up-front (possibly recasting it in different terms), and thinking through the actions involved in order to best utilize simple, built-in data structures and functionality. With this approach we essentially reshape the problem to fit our data structures, rather than the other way around. 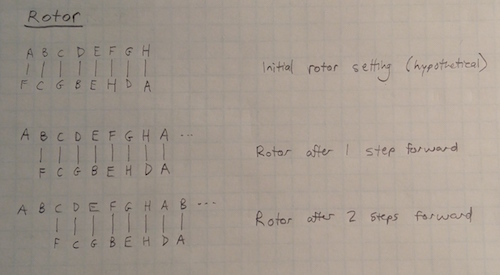 To get a better sense of what the verb approach looks like, let's look at the Enigma rotors. This operation, when broken down, is trivial: we are matching two characters from two strings, both at a particular location. When we were going through Rotor I the first time, A became E, and E became L; when going through in reverse, E now becomes A, and L now becomes E.
Applying this multiple times in sequence applies multiple scrambles and replicates multiple rotors. One of the reasons an object-oriented approach may seem natural, besides the chosen language suggesting it, is because the Enigma is an object with a state. Objects provide a natural way of representing things with an internal state, or information specific to that entity and required for its operation. For this reason, it may seem at first blush that the Engima requires an object-oriented implementation. However, we can continue with our verb-centric thinking, and examine how the operations change when the wheels are rotated. As the wheels rotate, we are still performing the same index lookup operations, we are just rotating each scrambled alphabet by one character. Again, this is a trivial operation that is probably built in for string types. Now let's cover the switchboard and reflector transformations. The reflector pseudocode looks identical to the switchboard pseudocode, except the reflector defines pairings for all 13 posible letter pairs, instead of only 7-10. Again, no need for a reverse version, since the reflector is a symmetric transformation. Almost there. We have one more thing going on - those rotor wheels are moving. Add the "increment rotor wheels" verb, and define that below. Each rotor wheel has a notch located at a particular letter. The wheels were identified by the letter on which the notch was located (Rotor I was "Royal" because the notch was located at "R", and so on). The notches were designed to catch on the notches of other rotor wheels, in such a way that the wheels would turn together periodically. The right-most wheel would rotate once per keypress. Once per 26 letters (if S = 26), the notch would catch the notch of the next rotor over and advance it forward by 1 letter. It was this mechanism that kept the machine constantly skipping through the space of possible keys, mapping each character to each other character, with one distinct key (alphabet scramble) used per letter of the message.